Placed in the garden or backyard, the Christmas tree will provide winter shelter for small birds. Another good idea is to decorate the tree again. This time hang it with special treats for the birds: Orange slices will attract birds, as will peanut butter spread on tree seed cones; or hang suet balls stuffed with sunflower seeds. If you set your tree outside for the birds, remember to careully remove all tinsel. Birds will try to eat the shiny stuff and it will make them sick. A Christmas tree is biodegradable. Its branches and needles make a good mulch in the garden, especially for plants like rhododendrons which like an acid soil. Many cities and municipalities gather Christmas trees on special collection days and put them through shredders which chop them up into small pieces. 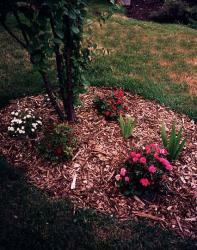 The resulting mulch is then used in the summer on the flower beds in city parks. Fir tree foliage can be stripped from the branches and snipped into small pieces for stuffing into aromatic fir needle pillows for the sofa or bedroom. Some people also use fir foliage in dresser drawers to give clothing and blankets a fragrant aroma. Large quantities of used trees make effective sand and soil erosion barriers, especially at beaches. Old Christmas trees stacked together in a forest provide shelter for rabbits and other small animals. Sunk into fish ponds, Christmas trees make excellent refuge and feeding areas. Woodworking hobbyists can make a multitude of items from the trunk of a used Christmas tree including buttons, gavels and candleholder. Christmas Trees are put through shredders to create useful mulch. Their basic production characteristics make Christmas trees an extremely friendly farm crop, both to our environment and to people and animals. A broad network of roots holds the soil and a continuous ground cover prevents surface erosion by water and wind. As a long term crop, trees allow a natural buildup of bird and animal populations. Tree farms provide stable refuge and feeding areas for wildlife, often very near large urban centres, at no cost to the taxpayer. Some farms allow visits at different times of the year. Their accessibility and the quiet, park like surroundings make these farms very pleasing to people. Like all plants, the conifers growing for eventual harvest as Christmas trees remove carbon dioxide from the atmosphere as they grow and produce oxygen as a byproduct. One acre of Christmas trees produces enough oxygen for 18 people. Without this process of photosynthesis, life could not exist on earth.